Pioneers in the industry, we offer ds-215 bed scale from India. Weighing the elderly & critically ill patients can sometimes be a huge challenge for physicians in Critical Healthcare Institutions. Very often, such patients are unable to move out of the Bed and get weighed in a regular Weighing Scale and this leads to huge compromises and delays in proper Medical treatment. 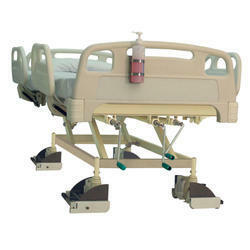 It’s fully portable design can be easily installed by any nurse in any type of Hospital Bed. Weight is accurately measured while the patient lies on the Bed. It also has other useful functions such as Tare & Pause. The DS-215 Bed Scale is an ideal Weighing solution for all CCU & ICU in Hospitals & Dialysis Centres.